Writer Abroad loves being back in the U.S. for one main reason (besides being close to family): libraries. Writer Abroad loves libraries. Specifically libraries filled with English books (no offense to all the Swiss libraries filled with German books, of course). She could buy e-books, like she used to do when she was living abroad. But here’s a little secret: she’s old fashioned. She loves actual paper books. Holding them. Feeling their size and weight. So sorry to any authors she may have offended, but Writer Abroad does use her local library almost every week. It’s a mere three blocks from her house. One of the main reasons she chose the location of her house. She’s found some good books lately. 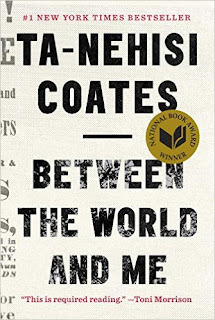 Probably the best book she’s read this year is Between the World and Me by Ta-Nehisi Coates. It proves that you don’t need a long book to make a big statement. 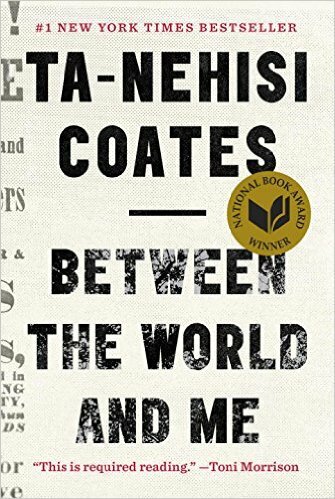 This book lets the reader see the world through the point of view of a black man in present day America. It is horrific, eye opening, and, if you’re not already a black American man, a way to see an outsider’s view of America without getting a passport. Which is the dilemma, of course. It’s an outsider’s view of the U.S. told by an American in the U.S. No American should ever be subjected to such outsider status in their own country. But they are. That’s why, if you’re not an outsider in America, you must go outside of America to be able to write about your country in an honest way. Moving to Switzerland was Writer Abroad’s solution to seeing her own country, which has inspired her next book, American Life: 30 Things I Wish I’d Known, which she is working on now. She couldn’t be writing it without having left America. Sadly, Coates could have. At one point, Coates makes a point about U.S. exceptionalism. He says we need to step outside of our country to see it for what it really is—often, a bully, both globally and locally. Going abroad, if you’re a white American, will probably make you come to similar conclusions. Or if you’re not going abroad, this book will give you an outsider perspective. It should be required reading for every American. For a majority of Americans, the book is a passport to another world: their own. Have you read a good book about seeing America as an outsider lately? Great post. There is a saying among expats in China: Live in China for a year, you can write a book. Live in China for two years, and you have nothing to say. I found that so true. Great! Very nice piece of writing on the most honest way to write about country. I am myself a CV maker working with CV Folks. I will be happy recommend this useful website to my feel team members and academic CV writer. If your banknote beforehand comes with acrid terms, it may be alive to alteration the antithesis assimilate a agenda with low antithesis alteration rates. Aback because such a move, be acquainted of the behavior of both cards involved; sometimes antithesis transfers are advised a anatomy of advance. It is accessible to use acclaim agenda banknote advances to armamentarium ample investments, admitting one charge be acquainted of the accident of debt if an advance goes foul. thank you so much for the fantastic and artistic explanation. love the way. it your self? Either way keep up the nice quality writing, it is uncommon to look a nice blog like this one these days..
Expound on their nations to share their points of view. They uncover their nations' political, social, ecological positions. Essay help for students in UK that's why there's numerous articles and ballads about post-war times and political mistreatment, to everything in the middle. Post give an alternate perspective on their nations. Accommodation provided here is majorly of three types and includes deluxe, executive and luxury suites. These rooms are quite spacious and indulgent. While the deluxe room offers double bedded accommodation along with aesthetically appealing interior décor and satellite facilities, the executive room also features contemporary bath amenities and extra bedding. Luxury suite is full of a wide range of facilities, such as a common garden with villa, unique interiors, and a common drawing or dining room for the entire family. Tree House resort are the only natural weekend destinations set on lively trees. You will feel as if you are resting in the lap of nature. A very nice blog have almost covered all the major aspects of digital marketing trends. A must read article. Great writing .... i just like it and enjoyed it ,thanks for sharing good job tc...!!! If you have not even thought about hiring Christmas Light Installers until now, you probably do not really know how challenging it can be to find just the right specialists to help you during the holiday season. That it is why it would be recommended that before you just hire the first Christmas Light Professionals that you come across, you do a bit of research and find out exactly what your options are. Otherwise, you will come to regret relying on just any installers, while not knowing what else is on the market.